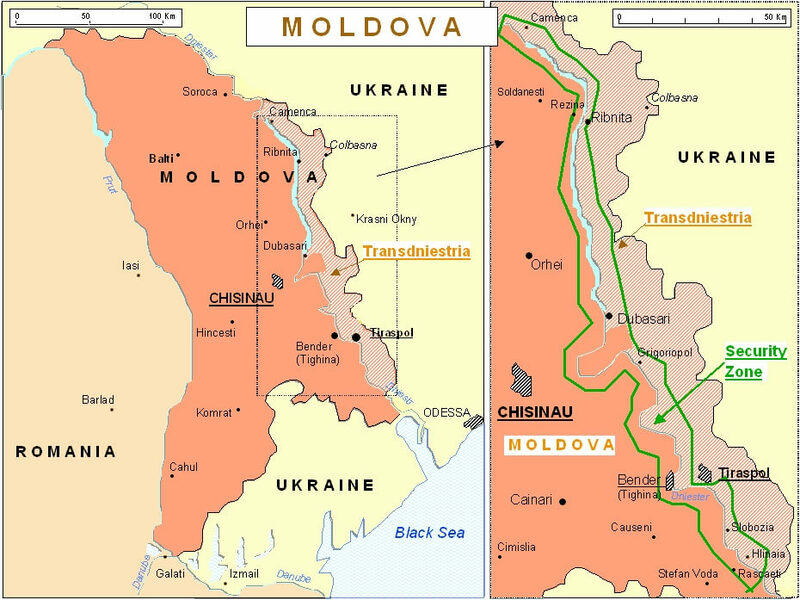 Home » Russia, Ukraine & the Caucasus » Olympic Games: Sports or Politics? Olympic Games: Sports or Politics? The most common form of political protest at the Olympics has been a state boycott. Only four countries—Australia, France, Great Britain, and Switzerland—have been represented at every modern Olympic Games since their inception in 1896. While some non-participation can be explained by the lack of athletes, most countries participated in one Olympic boycott or another. The three most wide-reaching state boycotts of the Olympics took place in the late 1970s and early 1980s. 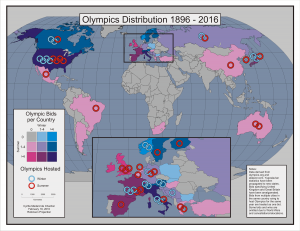 As can be seen from the map on the left, the majority of the world’s countries boycotted at least one of the following Olympics: 1976 (Montreal), 1980 (Moscow), and 1984 (Los Angeles); several countries—most notably China, Iran, Egypt, Sudan, and Ethiopia—participated in more than one boycott. As can be seen from a comparison with the second map, more countries have participated in Olympic boycotts than have hosted the Games. In 1976, a large number of African countries threatened to boycott the Games in Montreal with the goal of forcing the International Olympic Committee (IOC) to ban South Africa and Rhodesia, because of their segregationist regimes. New Zealand was another boycott targets, owing to the fact that its national rugby union team had toured apartheid-ruled South Africa. While the IOC conceded in the case of South Africa and Rhodesia, it refused to extend the ban to New Zealand on the grounds that rugby was not an Olympic sport. Consequently, twenty African countries along with Guyana and Iraq withdrew from the Montreal Games, doing so after a few of their athletes had already competed. 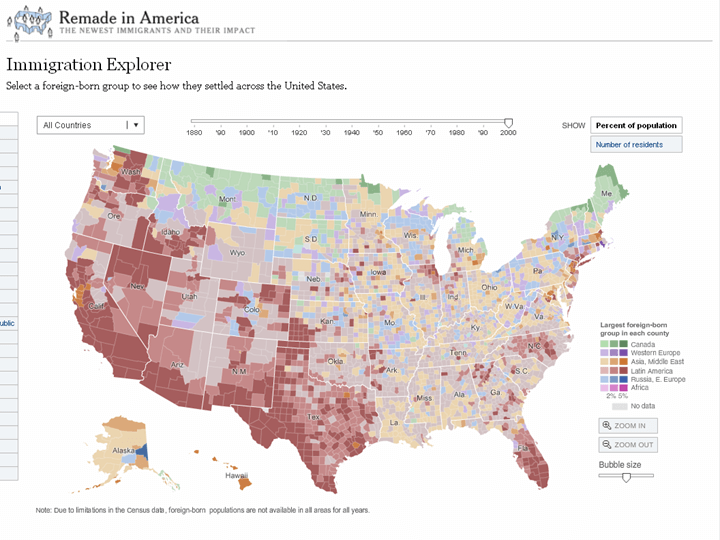 The map’s coloring of China with yellow is misleading, however. It was Taiwan and not People’s Republic of China that boycotted the 1976 Games. It did so as a result of the pressure exerted by the People’s Republic of China on the Montreal organizing committee to keep the delegation from the Republic of China (Taiwan) from competing under that name. A compromise was suggested: Taiwan would be allowed to use the Republic of China flag and anthem as long as its name was changed. However, Taiwan refused and did not participate in the Olympics until 1984, when it returned under the name of Chinese Taipei, using a special flag and anthem. In 1980 and 1984, the Cold War opponents boycotted each other’s Games in Moscow and Los Angeles respectively. After President Jimmy Carter pulled the United States out of the Moscow Summer Olympics in 1980, the Games saw the lowest number of participating countries since 1956. Only 81 nations sent their athletes to the USSR, while 65—shown in blue on the boycott map above—refused to participate because of the Soviet Invasion of Afghanistan. The Games took place in five cities across the Soviet Union, including my hometown of Saint Petersburg (then Leningrad), as well as the capitals of Ukraine (Kiev), Belarus (Minsk), and Estonia (Tallinn). Even though relatively few foreign athletes arrived in the USSR due to the boycott, Soviet authorities were still very concerned about possible encounters of the foreign visitors with the local residents. Being in elementary school at the time, I did not understand why our school principal took such a keen interest in everybody’s vacation plans for the summer of 1980; children and their parents were strongly “encouraged” through their schools and workplaces to leave the city. I imagine that similar measures were taken in other Olympics-hosting cities. Whether these measures succeeded or not, the later part of the Games was marred by another unforeseen turn of events: the death and unauthorized mass funeral of the immensely popular and beloved actor and singer-songwriter Vladimir Vysotsky, whose songs often featured social and political commentary. Many of his fans saw the constant harassment by the government as contributing to his untimely death at the age of 42. Although no official announcement of Vysotsky’s death was made and only a brief obituary appeared in the Moscow newspaper Vechernyaya Moskva, the mourning ceremony turned into an unauthorized mass gathering of tens of thousands of people, and the attendance at the Olympic events dropped noticeably on that day. The 1980 boycott prompted the Soviet Union, joined by 15 other countries, to reject the 1984 Games in Los Angeles, ostensibly because the organizers could not guarantee the safety of the Soviet-bloc athletes, pointing to the alleged “chauvinistic sentiments and an anti-Soviet hysteria” in the United States. The boycotting nations of the Eastern Bloc staged their own alternate event, the Friendship Games, in July and August 1984. This event was in line with the earlier tradition of the Soviet Union running an alternative international sports festival called the Spartakiad. The term derives from name of the ancient slave rebel leader Spartacus, who was supposed to symbolize proletarian internationalism because the revolt he headed united slaves from diverse ethnic backgrounds within the Roman Empire. As a Classical figure, Spartacus stood directly in contrast to the aristocratic nature of the Ancient Olympic Games on which the modern “capitalist” Olympics were supposedly based, according to the Soviet ideology. The first Spartakiad was a USSR-internal event, but later athletes from other countries participated as well. International Winter Spartakiads took place in 1928 and 1936, both times in Oslo, while their Summer counterparts occurred in 1928 in Moscow, in 1931 in Berlin, and in 1937 in Antwerp (the 1936 Spartakiad in Barcelona was cancelled due to the Spanish War). Ultimately, the USSR joined the International Olympics movement in 1952. That same year, Soviet athletes competed in the Summer Games in Helsinki. Nonetheless, the term “Spartakiad” persisted for internal sports events in the Soviet Union at different levels, from local championships up to the Spartakiad of the Peoples of the USSR, which was held twice in four years, with international participation. In the 1956 Olympics in Melbourne, the Soviet Union emerged as a sporting superpower, taking full advantage of the publicity that came with winning numerous medals at the Games. 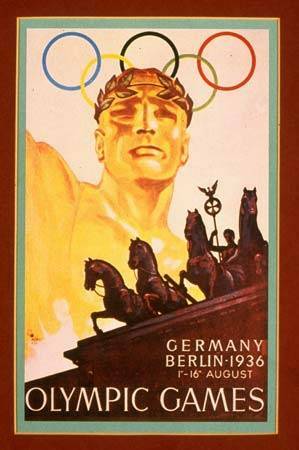 Two decades earlier, Nazi Germany also used the Olympic Games to promote its ideology. In the 1936 Games in Berlin, German officials portrayed the National Socialist Party as benevolent and peace-loving and sought to prove alleged Aryan superiority. Germany did indeed win the most medals, 89 in total compared to the second-place United States with 56 medals. Yet notable victories by the African-American track and field athlete Jesse Owens, who specialized in the sprints and the long jump and won four gold medals in Berlin, and by the Hungarian Jew Ibolya Csák, the winner of the women’s high jump, dispelled such Aryan claims. A JWeekly Editorial recently drew a parallel between Jesse Owens’ Olympic gold in Berlin in 1936 and the United States “sending a team to Sochi that includes athletes who proudly identify as gay and lesbian” in 2014. A number of other countries that participated in various Olympic boycotts can be added to the map above. The Olympic Council of Ireland boycotted the 1936 Berlin Games, not because of the Nazi ideology but because the IOC insisted that its team needed to be restricted to the Irish Free State rather than representing the entire island of Ireland. Three separate boycotts marked the 1956 Melbourne Olympics. 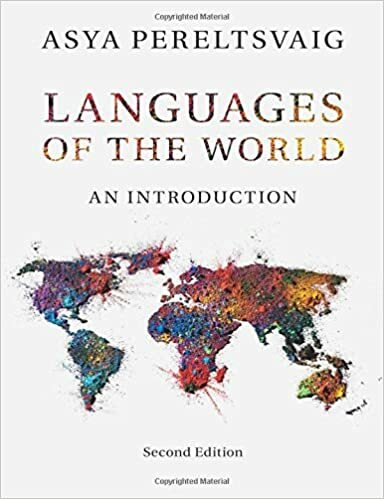 The Netherlands, Spain, and Switzerland refused to attend because of the repression of the Hungarian uprising by the Soviet Union in the weeks prior to the opening of the Games. Cambodia, Egypt, Iraq, and Lebanon mounted a boycott because of the Suez Crisis. The People’s Republic of China boycotted the Games because Taiwan was allowed to compete as the Republic of China, an issue that would continue to simmer for several more Olympics. In recent years, there have been fewer boycotts of the Olympics. Calls were made to boycott the 2008 summer Games in Beijing in protest of China’s human rights record, and in response to the situation in Tibet. However, no nation supported a boycott. 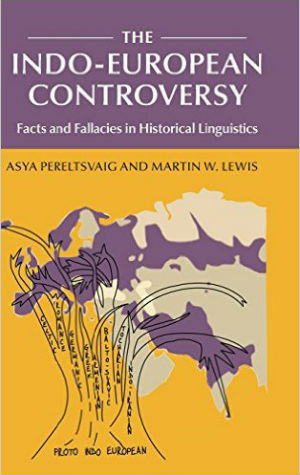 Protests against the Sochi Olympics started as early as August 2008, when the government of Georgia called for a boycott in response to Russia’s active participation in the 2008 South Ossetia war. While several world leaders, including US President Barack Obama, President of France Francois Hollande, European Union commissioner Viviane Reding, and German Chancellor Angela Merkel, have already cancelled their participation in the Olympics, due in large part to the gay rights issue, no country has officially cancelled its participation in the Games. Besides state-sponsored boycotts, individual athletes have used Olympic Games to express their political views. 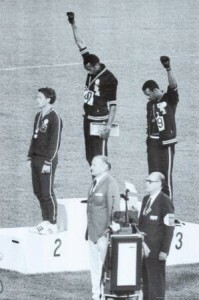 At the 1968 Summer Olympics in Mexico City, two American track and field athletes, Tommie Smith and John Carlos, who finished first and third in the 200 meters, performed the Black Power salute on the victory stand (see image). The second place finisher, Peter Norman of Australia, wore an Olympic Project for Human Rights badge in support of Smith and Carlos. The United States Olympic Committee, however, was forced by the IOC to send Smith and Carlos home. During the same Games, Czechoslovakian gymnast Věra Čáslavská protested the Soviet-led invasion of her home country by turning her head down and to the right of the Soviet flag when the Soviet anthem was performed. As a result, she was made an outcast by the pro-Soviet Czechoslovakian government and was banned from competition and traveling. More recently, two athletes—Georgia’s Nino Salukvadze and Russia’s Natalia Paderina, who won the bronze and silver in the 10 meter air pistol competition, respectively—placed sports above politics by embracing on the podium during the 2008 Summer Olympics in Beijing, which opened on the same day the South Ossetia War between Georgia and Russia erupted. While some political statements at the Olympics take the form of boycotts and silent protests, others are more violent. 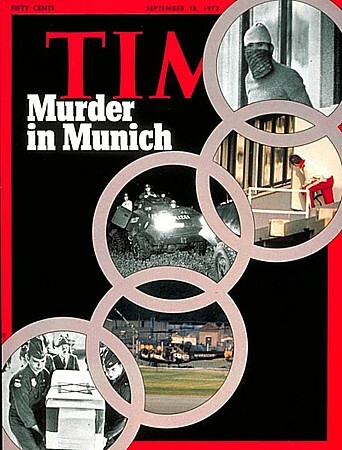 The worst terrorist attack directly affecting the Olympic Games took place during the Summer Games in 1972 in Munich: eleven members of the Israeli Olympic team were taken hostage by the Palestinian group Black September in what became known as the Munich massacre. The terrorists murdered two of the athletes soon after they had taken them hostage and the other nine during a failed liberation attempt. A German police officer was also killed, as were five of the terrorists. The last two Olympics held in the United States were marred by terrorism as well. During the 1996 Summer Olympics in Atlanta, Georgia, a bomb was detonated at the Centennial Olympic Park, killing two people and injuring over a hundred more. The bomb was set by Eric Rudolph, a domestic terrorist with an anti-abortion agenda, who is currently serving a life sentence for the crime. The 2002 Winter Olympics in Salt Lake City, Utah took place merely five months after the September 11 attacks. The opening ceremony featured the flag that flew at Ground Zero, NYPD officer Daniel Rodríguez singing “God Bless America”, and honor guards of NYPD and FDNY members. Because politics has always played such a major role in Olympic games, some people see political statements where none are intended. For example, American figure skater Simon Shnapir wearing an empty under-arm gun holster as part of his costume while he and partner Marissa Castelli performed to the music from the James Bond movie Skyfall in Sochi stirred some anti-gun groaning. One spectator twitted: “Leave it to America to do a gun-themed ice dance”. Another one echoed the sentiment with: “Not sure it sends the best message about America”. Shnapir himself told USA Today that “he’d preferred something closer to the real thing”, but only to keep “the whole Bond appeal”. Those who saw the empty holster as “too threatening, too violent, too American” should be reminded that the Winter Olympics include the biathlon, which involves using actual guns.